Maior autem his est caritas: The Mass as the Council intended it ... ? The Mass as the Council intended it ... ? Thank you, your Eminence! This is from Robert Cardinal Sarah, who was recently appointed to head the Congregation for Divine Worship and the Discipline of the Sacraments by the Holy Father. La réform liturgique voulue par le Concile ... the liturgical reform desired by the Council. So, what does the Council say? 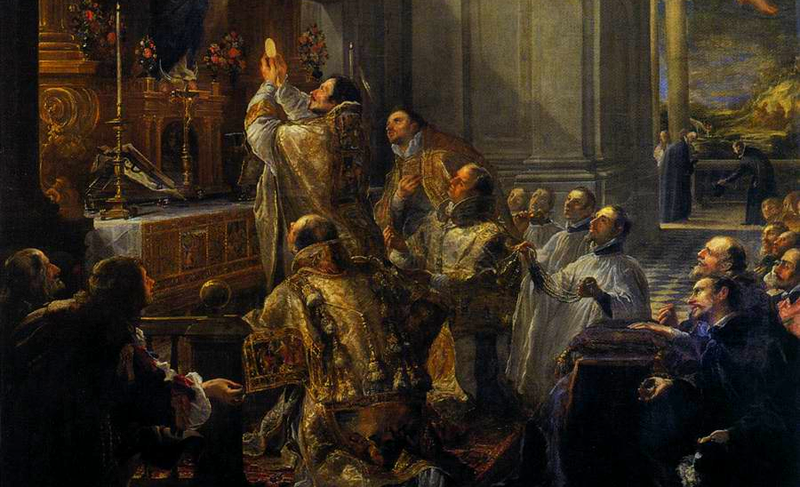 What does the Constitution on the Liturgy actually say? Hmm, how about the crowning beauty of the Roman Rite: Gregorian Chant? 116. The Church acknowledges Gregorian chant as specially suited to the Roman liturgy: therefore, other things being equal, it should be given pride of place in liturgical services. Pride of place. Do we see that at all? No? How much chant is there in one's average parish Mass? Any? Little? None? Then the liturgy we celebrate is not the liturgy intended by the Council, but the work of other forces. How about the Latin language? 2. But since the use of the mother tongue, whether in the Mass, the administration of the sacraments, or other parts of the liturgy, frequently may be of great advantage to the people, the limits of its employment may be extended. This will apply in the first place to the readings and directives, and to some of the prayers and chants, according to the regulations on this matter to be laid down separately in subsequent chapters. PRESERVED. Do we see that at all in our parish experience? No -- some, especially those who were told that the abandonment of Latin was the essence of the Council's reforms, get very upset even at the hint of the venerable liturgical language of the Roman Rite. The Council, it would seem, wanted the vernacular to be (rightly) introduced, but Latin to be preserved. Now we have to apologize if by chance, pious ears are offended at the sound of Latin! We have to fight to achieve what the Council, it seems, wanted. If we don't hear the Latin language in the Latin Rite, then the liturgy is not the liturgy intended by the Council, but the work of other forces. This list could be a lot longer. The more I study the history of the reform, the more upset I get. It's like we were robbed. Something incredibly beautiful was taken and mutilated, and destroyed. Yes, in some ways the Mass has come closer to the people. I believe he use of the vernacular is quite appropriate (especially for the Liturgy of the Word), and even of a diversity of appropriate musical styles. Yes, I was not alive in what a whole generation, it seems, experienced as the "bad old days." Yes the moralism and formalism of those times was excessive. Yes, there were many other forces at work in the decline of the faith that the past four decades have seen. However, I cannot but believe that somehow this is all connected to the heart of the Church, the liturgy and is one of the fruits of a liturgical reform that was a huge RUPTURE from what had been faithfully handed on before, a reform that truly and desperately needs to be seriously evaluated and examined, in the light of nearly five decades of experience. Thank God for St. John Paul II, who started righting the Barque of Peter after the tumultuous decades that followed the Council. Thank God especially for Pope Benedict XVI. Thank God for his wisdom, his teaching, his deep insight into the nature and spirit of the liturgy, his incredible humility, and the gift he gave the church in the Motu Proprio Summorum Pontificum, which Cardinal Sarah, in the same interview, calls a path to reconciliation, as well as a path to recognition of beauty and sacrality. My dear brothers and sisters in Christ, I hope, I fervently desire, that we fall in love with the amazing gift that is the liturgy again. It is not just some "thing we do," something irrelevant to the rest of our lives, that could be one way or another, depending on our mood or whim. It is the very encounter with the Living God! The highest activity of the Church! The Constitution on the Liturgy, #7, "...every liturgical celebration, because it is an action of Christ the priest and of His Body which is the Church, is a sacred action surpassing all others; no other action of the Church can equal its efficacy by the same title and to the same degree." Do we treat the Mass this way? Priests, as well as laity! Do we truly believe that we are coming into contact with the All Holy One, whose ways are not our ways? And most importantly, it is NOT ABOUT US. About the community, about our feelings. We bring ourselves and OFFER ourselves, on the altar, to be united to the one sacrifice of Christ, which is represented again for us. Oh to recover a sense of the awe, and amazing wonder of the Holy Sacrifice of the Mass! To gaze in adoration, in amazement, in awe, at the miracle of Jesus Christ, Body, Blood, Soul & Divinity, coming down into the humble host, the mere fruit of the vine, to feed His people! To feel the fire of his love, the depth of his thirst! To be touched and set on fire and transformed by that encounter with HIm who is Love itself! To then go out, His representatives, His faithful, to proclaim Good News, to live the beauty -- and contradiction! -- of the Gospel! To heal a wracked world! Give us O Lord, a zeal for souls! Increase our faith -- especially of your priests, O Lord! -- increase our hope -- increase our love for You! Yeah, well, they weren't the "the bad old days" as much as they were the indifferent old days. And how could they be anything else? Lots of people spent the Mass praying a rosary, because that was what they could understand. I'd be more convinced in your correctness if the support you cite wasn't so clearly cherry-picked. At item 116 the statement that Gregorian Chant has pride of place, is not the same thing as primacy. In context, it seems to me it means something more like 'in spite of everything we've just said, we don't mean to throw the baby out with the bath water and it will always be correct to use Gregorian Chant'. that the congregation is able to participate in the Liturgy with song. These debates are not nearly as one sided as you present them. Plus, in my experience, most Catholic Churches use Chant in hymnody, albeit in the vernacular and not Latin. It doesn't have to be Latin to Chant, or, if you say that it does, would you also say that it has to be on a four line staff with square notes? Because if you say that, you really are going to disenfranchise the multitudes that don't know a punctum from a torculus, and don't care, and they aren't lesser people because they don't care. Plus, virtually every Catholic hymnal has chant hymns contained within it. Perhaps not in the Latin, but chant hymns nonetheless. That they are in the vernacular and not in Latin does not make them any less chant. Or, if you would insist that it must be in Latin, would you also insist that it be notated on the four line staff with square notes? Because if you do that, you will really disenfranchise multitudes that do not know a punctum from a torculus. They do not care, and they are not lesser people because of that. In context, the Vatican documents expect us to be full, active, and conscious participants of the Mass. You make that stated goal at the end of your post, but your path to that conclusion is very rocky in my opinion. Yes, God is object of our praise, but as members of the body of Christ it is incumbent upon all of us to actively work together. In that sense, it is about us. It was truly a courageous gesture for the Church to draw near to the people of God so that they are able to understand well what they are doing. This is important for us, to follow the Mass in this way. It is not possible to go backwards. We must always go forward. Always forward! And those who go backward are mistaken. Let us go forward on this path. This is paraphrased and roughly translated, but you can find the exact comments on YouTube. We've been "going forward" for 50 years. It's worked out SOOOO well.